Among the thousands of Syrian refugees who fled the ravaging civil war in Syria, many are finding hope and opportunity for a new life in their homeland of Armenia. 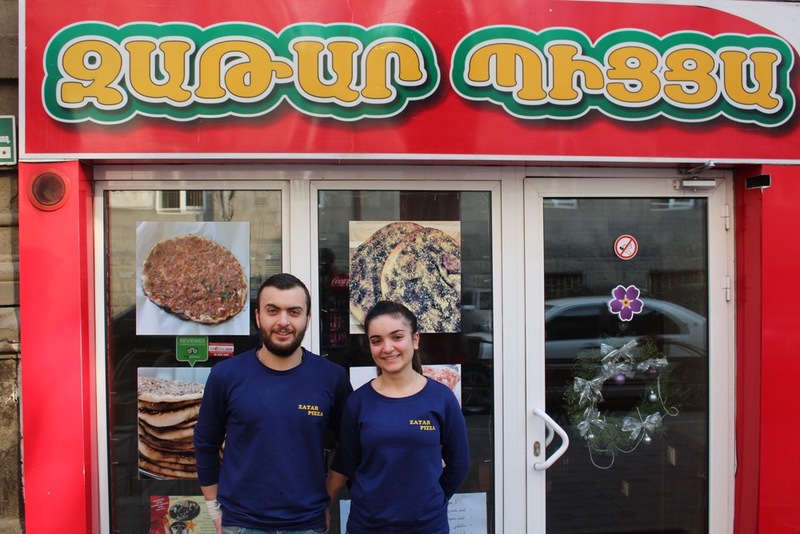 The Baharians who run the famous Zatar Pizza in Yerevan are one of them. Since it opened its doors in late 2012, Zatar Pizza has made a name for itself both among Yerevan locals and visitors from abroad. Located just a few steps away from the Republic Square in downtown Yerevan, Zatar Pizza serves Syrian and other Levantine favorites. Zatar Pizza was one of the first restaurants to introduce zatar, a classic Levantine spice mix of dried thyme and other herbs, to the Yerevan food scene. 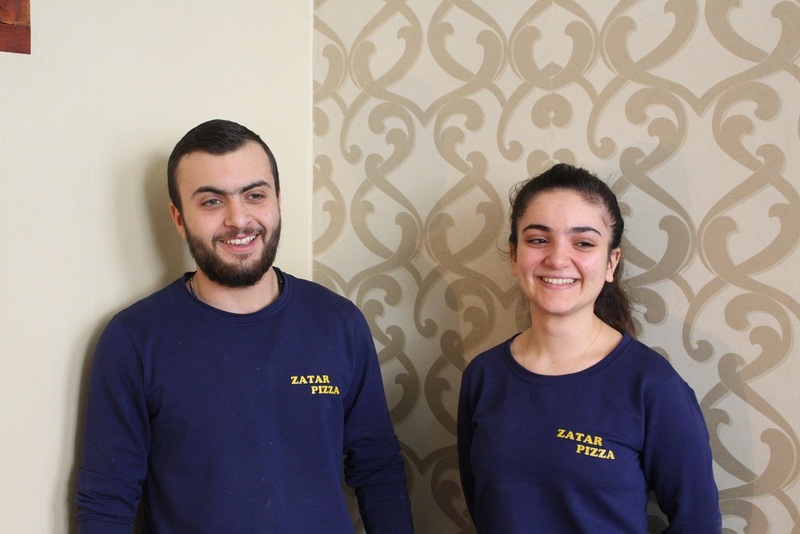 Lusine Mkhmelian-Baharian, her daughter Haigan, and her nephew Antranik have been with Zatar Pizza since its start. Lusine and her children came to Armenia in October 2012 and opened Zatar Pizza a short two months later. The restaurant is owned by Lusine’s brother-in-law and his business partner , but it was Lusine who got the business running the first two months after opening—with her own recipes and spices. She cooks everything the way she would at home, using the exact same flavors and ingredients. They used to bring the zatar from Syria but as the war worsened, transport became more challenging, so Lusine began to make zatar herself. Now their zatar is famous among locals for its authentic flavor and high quality. Currently Lusine’s son works in the kitchen, and her daughter Haigan serves the customers with the help of her sister-in-law’s two sons, Anto and Nshan. “In summertime lots of tourists come; many of them are familiar with our specialties and seem to really like them. Everything is homemade here. We were the first here in Yerevan, and to this day we strive to keep it.” says Lusine. The Baharians say that they are happy that they opened the restaurant and decided to stay in their homeland. They have great relations with their customers. At Zatar Pizza the customers come from Australia, France, England, America, and they are all still in touch with them to this day. They have become a sort of family and they throw them farewell gatherings when they leave. They also stay in touch with one another; they become friends on Facebook and talk on the phone frequently. These are the sorts of memories they make here. Many ethnic Syrian Armenians have had long ties with the republic of Armenia over the last half century through various waves of repatriation and student exchanges. This last wave of forced migration due to the war in Syria has last almost 5 years. While some of the Syrian refugees that sought temporary refuge since 2012 in Armenia have now decided to turn into "economic migrants" and emigrate again, many like the Baharians are looking to integrate and build new lives in their historic homeland: Armenia. After the February 2016 workshop organized by the UNHCR, Ministry of the Diaspora, Gulbenkian Foundation, and the AGBU on durable solutions for Syrian refugees in Yerevan, The Armenian Redwood Project will be gradually switching its focus towards helping refugee families like the Baharians better integrate in Armenia.